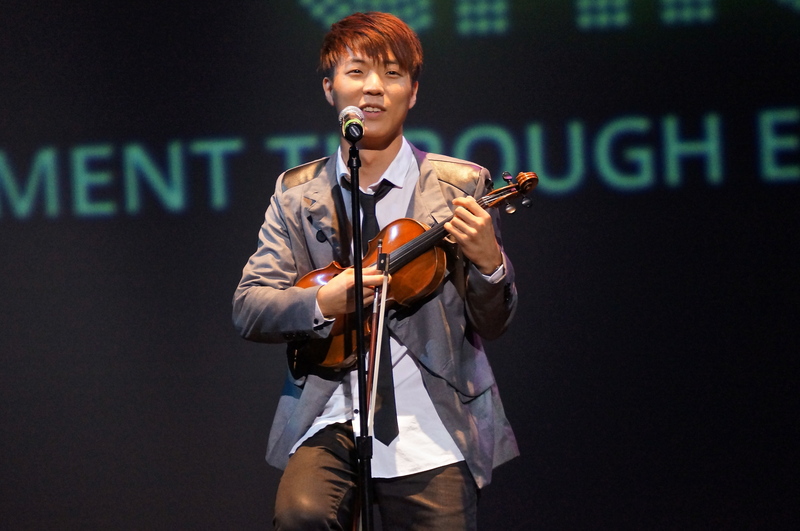 I had the privilege to see Jun Sung Ahn (aka JuNCurryAhn) at Kollaboration Chicago. For those of you who don’t know him, he is a very talent violinist who performs covers of different songs, usually Kpop related. He’s a true YouTube star with his versions of Gangnam Style and Adele’s Rolling in the Deep collecting more than 1 million views. You can check out his website here. 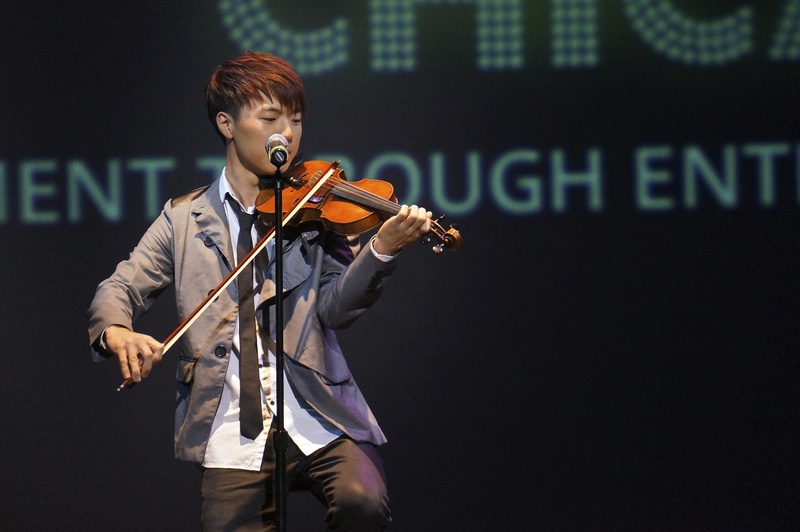 Jun Sung Ahn won Kollaboration Chicago last year and came back as a guest performer. It’s convenient that he attends Northwestern which was right nearby the venue. Couldn’t have planned it better! To begin, Jun Sung Ahn performed his mashup of Yiruma’s River Flows in You and Taeyang (of Big Bang)’s Wedding Dress. Both are great songs on their own and this violin mashup makes a wonderful combination. Check out my video below! His talent doesn’t stop at violin playing. This kid can also dance! Even more amazing, he can dance AND play the violin AT THE SAME TIME. Now that’s skill. Jun Sung Ahn took the stage along with 5 friends and they performed a dance cover of Korean boy band EXO’s Growl. The song is very upbeat with some slick dance moves. It was amusing to hear the various fangirl cries from the audience. While Kollaboration Chicago was held almost entirely in English and represented a wide variety of different Asian American communities, there were still quite a few Kpop fans in attendance. It was fun to see this kind of performance in America. It certainly doesn’t happen every day. While Jun Sung Ahn is an old pro with these moves (having already made a music video for the dance), I heard that some of the other guys only had a few days notice to learn it. Kudos to them! I thought it all looked great. It certainly was entertaining to watch! Due to some technical issues, his second violin piece had to be pushed to the end. I felt bad that he had to go straight from dancing back to violin playing. Despite this, his exhaustion wasn’t noticeable in his performance. He once again performed a mashup of a few different songs, namely 2ne1’s Ugly, Katy Perry’s Fireworks, Nicki Minaj’s Super Bass, and lastly Psy’s Gangnam Style. This time around he had help from 4 video versions of himself playing in the background. It was quite a unique way to perform! After the show, I felt for a minute like I was back in Korea surrounded by intense Kpop fans. When Jun Sung Ahn came into the lobby there was a steady flood of people asking for his autograph and to take a picture with him. I hung out in the back waiting for my chance to tell him that I really enjoyed his performance, but the fans never seemed to abate. I guess this comes with the territory of being a pseudo-Kpop star in America! Overall it was an excellent performance. I have to admit that it was pretty cool to see this YouTube celebrity up close. I hope I can see him perform again in the future. Until then, I’ll just keep watching the awesome covers that he has on his YouTube channel. I hope you also enjoy my own videos that I posted here! I had a lot of fun taking them. Which one is your favorite? I personally like the EXO cover the best!